Home › Electronics › King's Dun New 25 In 1 Repair Opening Tool Kit Pentalobe Torx Phillips Screwd..
King's Dun New 25 In 1 Repair Opening Tool Kit Pentalobe Torx Phillips Screwd..
25 in 1 Professional precision multi-driver set including: Torx, Pentalobe,Phillips, tiny screws for cell phones,eyeglass repair, watch repair, Tablet PCs /Mp3-Player,Macbook repairs and hobbyist alike. This is a high quality Screwdriver Kit Set that can be used for so many different types of jobs, a must have if you're like me and want to fix things yourself. A perfect place to start with a see-through lock for locksmith and lock pick trainer. 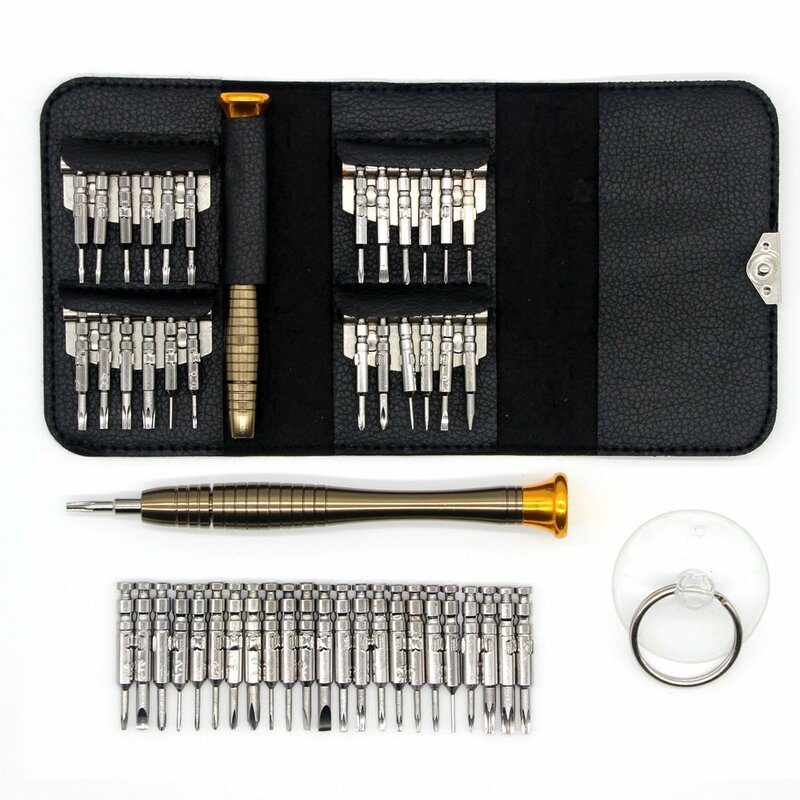 Color: 25 IN 1 Screwdriver set Description : Kingsdun 25-piece quality precision multi-driver set is an ideal tool set forelectronic workshops, watch repair, eyeglass repair, and hobby miniatureswhere fine precision is required. Leather wallet holds the screwdrivers, portable and not easy to drop. High-end leather protect screwdrivers from loosing, crush. Different head size suits different usage. 25 screwdriver heads are suitablefor disassembling computers, smartphones, glasses, watches, etc. Allscrewdriver heads have been processed with high temperature. The grip is made of aviation aluminum, high-quality, durable and convinientto use with the bearing at the tail of the grip. Usage: repairing computers,smartphones, television, telephone, glasses, CD/VCD/DVD device, opticaldevice. A practical tool for repairing. Kit Contents: Hexagonal Screwdriver Hexagonal sizes :T2,T3 ,T4 ,T5, T6, T7 ,T8 ,T9, T10, T15 PH Screwdriver PH sizes : 1.0 ,1.2, 1.5, 2.0, 3.0 Slot Screwdriver Slot sizes : 1.0, 1.5, 2.0, 3.0 Triangle Screwdriver Triangle sizes : 2.0, 2.3 Pentalobe Screwdriver Pentalobe sizes :0.8 ,1.2 and other 1xSlot Eject Pin Tool 1xScrewdriver Handle 1xSucker (Free give) Warranty: 45 days money-back & 18-month warranty. Any questions you have, please don't hesitate to contact us. We will get you back within 24hours. Feedback If you have any questions about the goods or the usage, please do not hesitate to contact our customer service .We appreciate your help in improving our products and service.